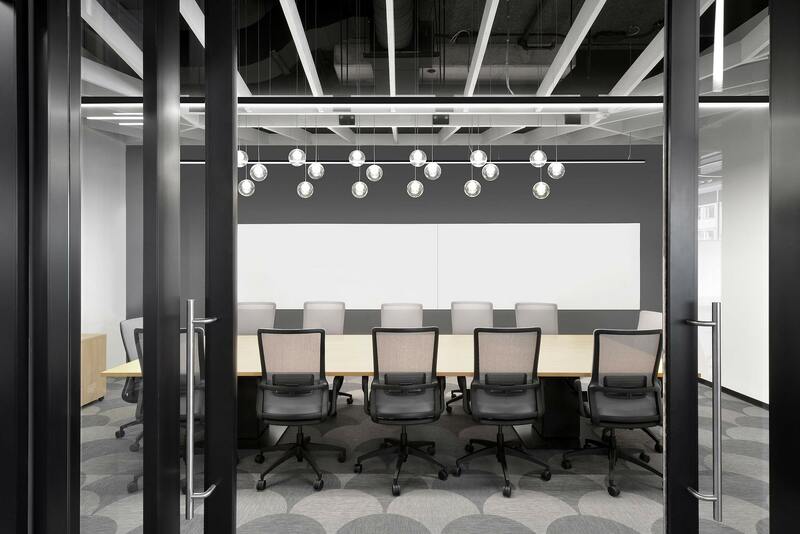 The Canadian Medical Association’s newest company – Joule – needed a creative and inspirational design for their new headquarters. 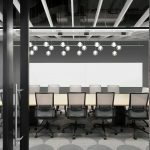 Joule’s mandate is to stimulate physician-led innovation in the development of leading edge products and services; they knew they required a space which support their mission, sparking ideation and communication for their staff and collaborators. 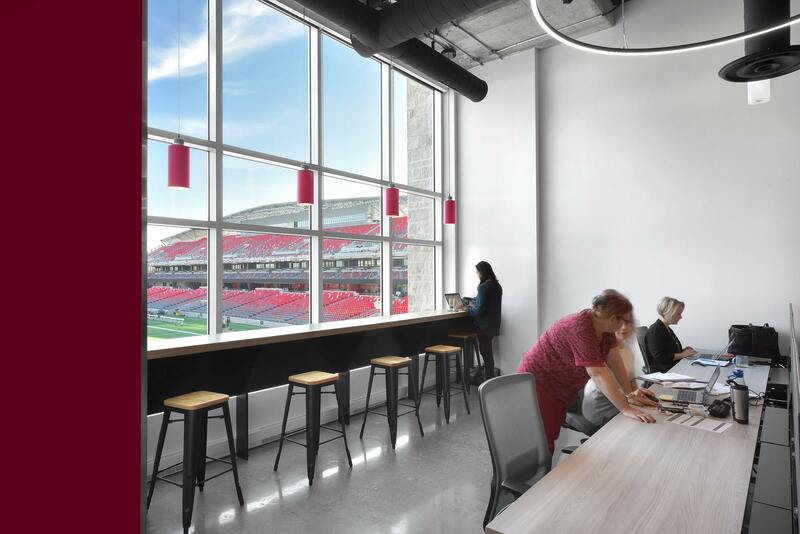 For designers Chmiel Architects, first step was to select a decidedly atypical site for an office – a building facing Lansdowne Park’s football field, home of Grey Cup champions, the Ottawa Redblacks. The 2 storey, 10,000 square foot building features a concrete structure with 14 to 16 foot ceilings and plenty of natural light. The space is a study in the unexpected, aiming to foster imaginative thinking for the 80 or so staff. 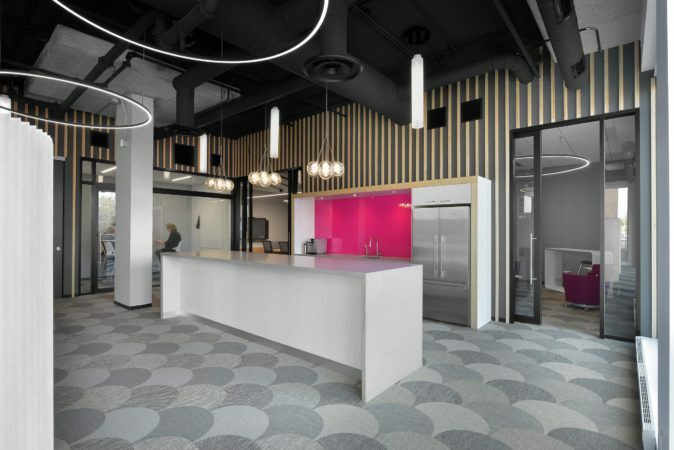 The hot pink corporate colour, featured throughout, is the first indication of something unconventional for an office environment. 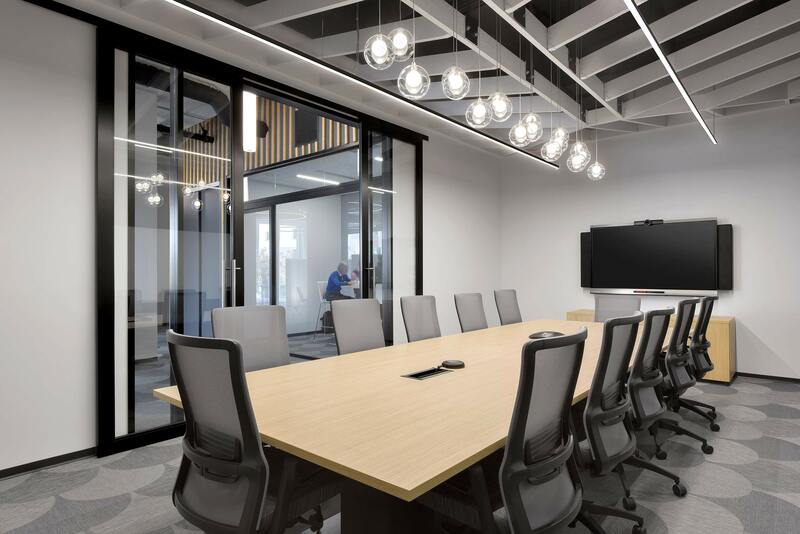 The palette of materials includes contrasting warm and cold materials – laminated veneer wood slats, felt, and textiles versus glass, concrete and steel. Lighting sets the mood, with slim, glowing LED rings for general illumination. These are suspended at a lower level to create a sense of enclosure as well as introducing an intermediate horizontal plane which plays against the verticality of the space. Further, a series of fixtures in a variety of cylinders and globes create identity in the space by delineating the various types of areas on the floor. 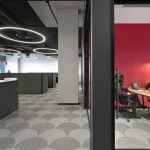 The circular motif, which takes its cue from Joule’s branding, is also evident in the floor treatments, with a fish-scale patterned woven vinyl floor tile providing strong graphic interest. One particular challenge facing this project at inception was the amount of space available. At 125 square feet per person, it was evident that some strategic moves had to be made. The whole space was subsequently planned as a 100% free-address environment, meaning that there were less workstations than staff. No one, not even the Joule CEO, had a dedicated spot. The entire staff was still accommodated however, but not necessarily at a desk. This encouraged people to move about in the office (or outside the office) to best suit their task at hand. 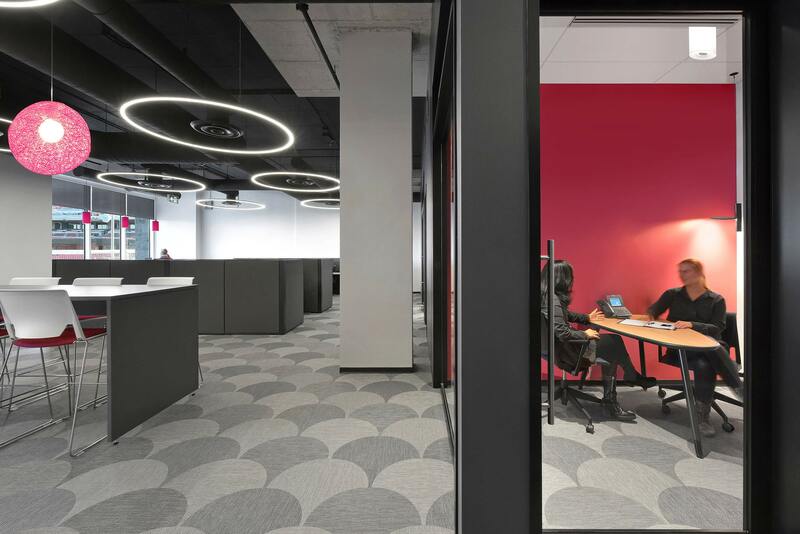 In order to support the various workstyles present in the organization, the floor was divided into a heads-down “focus” side and a lively “collaborate” side. Staff were encouraged to pick which side to work on according to their work activity or personal workstyle. 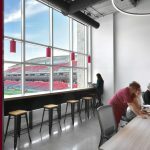 Various open and closed collaboration spaces were provided throughout, including upholstered “bleachers” and bar height counter seating facing the football field, high back soft seating on wheels surrounded by movable fabric walls, collaborative filing islands, and glazed meeting rooms of various sizes. 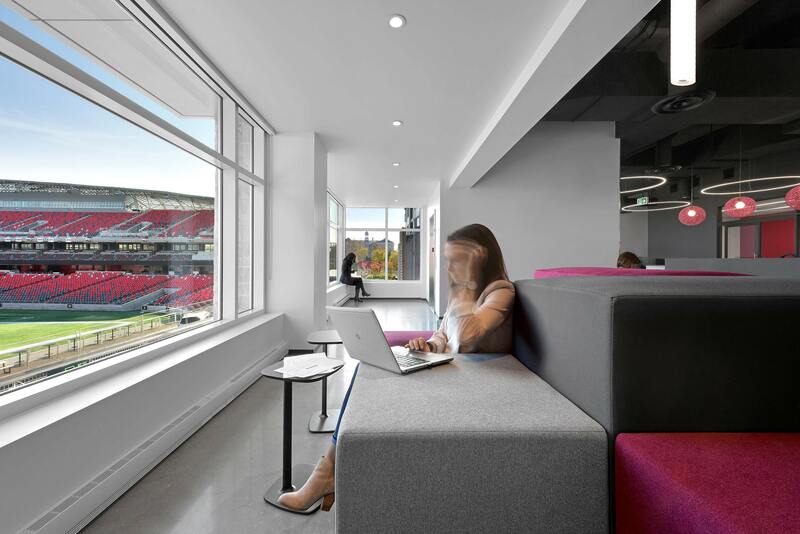 Sit-stand work-surfaces, a raised floor system for power and data, Wi-Fi throughout, and biometric scanners allowed flexibility and freedom of movement in an enhanced, technology-enabled user experience. The end result is a dynamic, vibrant and flexible Joule workplace with a palpable energetic vibe, drawing inspiration from the space itself and the unexpected views beyond.